The rule of the year so far seems to be that all of our storm systems moving into Colorado can best be described as “complex.” But then again, when is weather in Colorado not complex? A strong and powerful storm system is moving into Southern California today and while that usually doesn’t concern us too much (they usually stay too far South to bother Northern and Central Colorado) nearly every model has the storm moving North after it cruises along the Mexico border. This means that the storm will have a lot of moisture to work with. Let’s take a look at this storm system with the data we have today and why it’s so complex to forecast. The good news is that every model takes this storm on a similar track. After it swings through Southern California it moves up through New Mexico and in a Northerly/Northeasterly direction. The tricky part is the expected track deviates slightly between our two longer range models. This may not seem like too big of a deal, but if you’ve followed us for any length of time, you know a little wobble in the storm track (as much as 20-50 miles) can make a huge difference! I’ll show two of our longer range models below and talk about some of the similarities and differences, this is the 72 hour position so this is the position of the low pressure system around 5PM Sunday. The GFS takes the storm system quickly off to the Northeast. If this happens quickly or the low sets up further South, the Castle Rock/Denver area would miss out on the majority of the heavier snow. 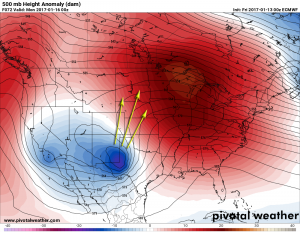 The GFS shows the storm in Eastern New Mexico as of Sunday evening. It then takes the storm quickly off to the Northeast. If the storm center moves to quickly or sets up too far South before moving Northeast, this could mean the bulk of the moisture misses the front range and strong upslope never gets a good chance to establish. Most models are showing this solution so there’s a stronger likelihood this situation or something close to it verifies. The Euro has roughly the same position of the low at the 72 hour but the storm track it takes is different. The European model shows the storm taking a slower more Northerly track. This would mean more moisture making it the front range, stronger upslope and the blocking high out East causing it to “linger” in the area longer. We are not quite in range of the medium range (NAM, etc…) models just yet but they will be coming soon. So if the Euro is the only one showing a big snow event, whey are we even bothering with this storm? With a large majority of the models showing a more quick, Northeasterly track with this storm, you could almost consider the Euro solution as an outlier. So why don’t we just throw that result out? The image below shows model “skill” accuracy rates when forecasting out up to 6 days. Simply put: the Euro is our most accurate model hands down. 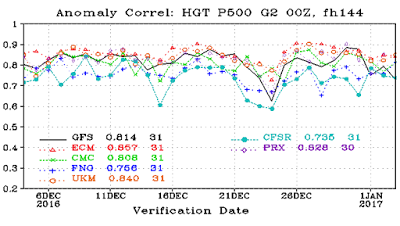 The Euro is shown to be more accurate against every other major model we use. While a larger number of models have a different solution, the Euro’s accuracy rating means we can’t completely rule it out. The Euro has, on occasions been the only model to call it right when all others missed… remember Super Storm Sandy? Suffice it to say, this storm doesn’t have a high probability to set up as a major snow storm for us, but the probability if it not setting up in that way is not zero either. Hence why I keep repeating, there is a ton of uncertainty remaining with this storm! Storm track non-withstanding this is an interesting storm. It has a few notable characteristics we look for in a major snow producer for the front range area of Colorado. This is a strong low pressure system, you can see this from the deeper blue colors. Additionally if you follow the isotherms you can see the whole system tilts back to the West. We call this negative tilt and it can help enhance moisture transport and boost upslope along the front range if it holds that shape. The closed off low also signals a strong system with the possibility of enhanced moisture transport. 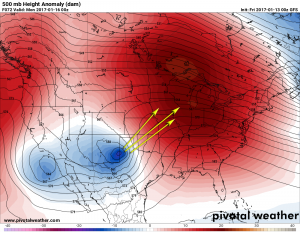 The big catch here is that is nice as the setup is, the storm track and speed has to play major ball for us to get anything out of it. This is why we need to keep a close eye on this storm. Please keep an eye out for our updates here (or whatever your favorite trusted weather source is) as we will continue updates as the forecast and models change. Again, no reason to get super concerned about this storm just yet as the probability is quite high that it doesn’t majorly impact our area, but it’s worth keeping a close eye on.